The table of contents doesn’t mention it, but the title page is labeled “Michael Gagne’s The Saga of Rex.” I’ve long thought the only thing worse than a set of chronicles was a saga. But as far as self-proclaimed sagas go, this one isn’t so bad. This is the continuing story of that little fox on an alien planet that has been in the last few Flight collections, the one who picked up a jagged crystal shard that resembles a unicorn-like horn in his forehead. With so much time between Flights, I lose track of the particular narrative beats of this story, but it is nice looking, and it’s perfectly legible, despite the complete lack of words. This is a pretty charming action adventure story, with a dash of character comedy thrown in. The titular “International Mistress of Swordmanship” and her servant/sidekick/love interest (?) 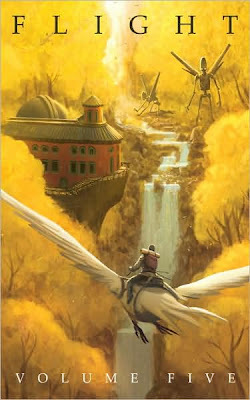 Mr. Selim crash their airship near an aqueduct, and have to escape an army. It’s very well done, but seems sort of context free, like a middle chapter of a longer story that lacks a beginning or ending. See above, only replace Delilah Dirk and Mr. Selim with an anthropomorphic fox and the army with a mech-like battle suit thing. It looks nice and works well, but isn’t really grounded in anything bigger than itself. I’m not a fan of baseball—in fact, I don’t really like anything about it and never have. But for some reason, I do enjoy reading comics about it. This was one of my favorite stories in the collection, perhaps in large part because it’s a standalone story that feels complete (despite the title). It’s about a little boy having his faith in the sport shattered and renewed in the space of a single game, thanks to his favorite player “The Bopper” turning out to be an arrogant jerk and a rookie from Cuba turning out to be a really cool guy. I should also note that I really liked the coloring in this story. It’s very simple and basic, and doesn’t have all the fancy gradations and lighting effects of so many of the stories here. That stuff can look great, of course, but I really like the pure comic book-ishness of a red baseball uniform on a man standing on green grass under a blue sky. 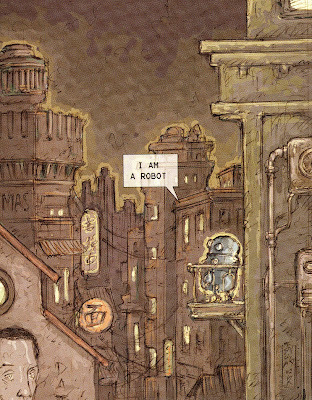 Anthology editor and cover artist Kibiushi’s short story is about an urban messenger in a futuristic city. Unlike the guy on the covers, he doesn’t ride a giant bird. Beautifully illustrated and well told, but it doesn’t really say or do anything beyond looking nice. I’m a big fan of the work of artist Sonny Liew (My Faith In Frankie, Wonderland, Re-gifters), so I am perhaps biased towards liking his contribution. A down-on-his-luck, out-of-work actor is having a rough time of things, and a loved one gives him a set of worry dolls to help him out. When he falls asleep, the dolls come to life, crawl in his ears, and try to clean the worries out of his brain, but his medication interferes with the usual worry doll routine, and they end up driving a sleep-walking dude around town. Amusing and well illustrated, but I was a little let down by the doll design; they’re cute, but they don’t look particularly worry doll-like. 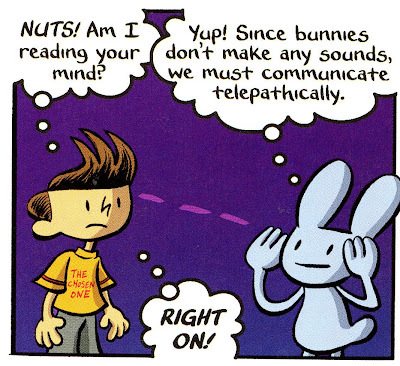 There’s no real reason Scott Campbell’s “-Head” strips, in which humanoid blobs are named for the objects atop their heads, should be funny at all, let alone still funny, but I’ll be damned if this one didn’t crack me up even more than the last one I read. I guess it’s all in the execution…? I don’t want to say anything about this story and risk ruining such an effective gag. But since this is a Graham Annable story, you don’t really need me to say anything, do you? And if you haven’t read any of Annable’s work, I think you’re probably wasting your time reading my blog at the moment; why are you reading me going on and on when you could be reading Grickle comics? A ninja fights a bunch of other ninjas to save a girl. And they are all super-cute, with big heads and ninja outfits that look like footy pajamas. A fairly straightforward story about the folk belief in fairy changelings, only with a bit of a twist; Mensinga’s animation background is clear in work, which features panels that look a bit like film stills. This is by far the weirdest story in the book. There are some really nice drawings of sea monsters in it. I didn’t much care for this one, which is far wordier than much of the rest of the stories within. 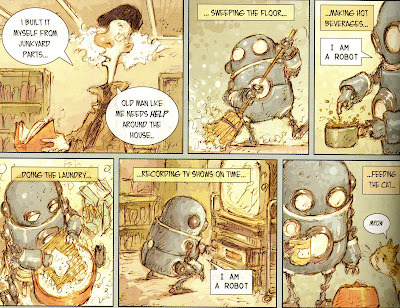 Rivoche draws some fantastic contraptions though, and his story is one of the more comic book-iest in terms of its coloring. EDILW favorite Dave Roman (Astronaut Elementary, Teen Boat) contributes a very funny story about some woodland creatures who tell a young boy he is the chosen one and send him on a quest. “Ha, of course!” I shouted to myself when I read that. As a child, it always confused me that rabbits didn’t make a sound like all the other animals children know about. Oh hey, it’s a Jellaby story. I was kinda surprised to see the mute, big-headed purple dragonsaur guy in this volume, as I was pretty sure he (and Soo) had graduated into their own books, but I was glad to see him here. It just wouldn’t be Flight without him, you know? The title kind of says it all. The earth stops spinning, which means there’s no gravity and everyone goes flying, the results ranging from funny to sweet, depending on who goes flying and what they were about to do before the earth stopped spinning. Marz’s art is really incredible; nice, loose, super-cartoony designs and a brilliantly idiosyncratic color scheme that’s pure pleasure to look at. This is, like, my favorite story in this volume. Joe Weiser (The Ride Home) tells the story of Timecat, a cat with the power to travel forward in time simply by thinking hard enough. He’s hungry and wants fed, but his master won’t give him any food for a few hours. Lucky for him, by thinking really hard for a few minutes, and then checking the clock, he realizes he has moved forward in time—but only a few minutes. It’s a really great gag, and Weiser plays it to the hilt. An attractive polar bear walks around, floats to post-apocalyptic New York City, and then floats back to the arctic. Something about global warming, I guess? Wait, did I already call another story my favorite one? Because this is my favorite. Or my other favorite. Anyway, Dramacon’s Svetlana Chmakova tells a rather darling little grade school melodrama about a weird little girl who tells her class she’s a princess from the planet Pluto and the little boy who teases her. A little boy with a big head and a big rectangular bear with no head collect caterpillars in a cardboard tube, leave it alone for a long time, and then find it again. Appelhans’ sparse style makes this story stand out quite dramatically from the rest of those in the book, with his simple black and white drawings filling four panels per page until the very last page, in which the format is broken dramatically and effectively. The big weird looking bear running around with finger-guns pretending to shoot his little human friend makes me smile. Do they come in men's size 10 1/2?